Wow, never heard of these two. Good work, TopBilled! Thanks Lawrence. Michael Chapin came from a family where all the kids were in show biz-- his sister Lauren Chapin played Kitten on Father Knows Best; and their brother Billy Chapin was in THE NIGHT OF THE HUNTER with Robert Mitchum. 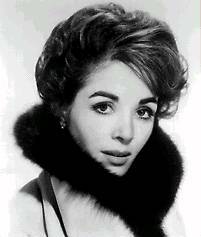 Thursday December 10th: An actress in westerns during the 50s who later gained fame as Mrs. Robinson. Yes. I will be featuring her this week. When people think about A PLACE IN THE SUN, they think about Montgomery Clift's performance as a troubled social climber who ultimately winds up in the electric chair. But the part was originally played by 1930s heartthrob Phillips Holmes in Paramount's first screen version, AN AMERICAN TRAGEDY. 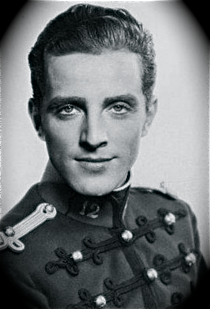 It was just one of over forty motion pictures for the Princeton graduate and leading man, often cast because of his dashing good looks. His career in movies had begun with an uncredited role in the silent era back in 1925, and it would continue up to the British comedy HOUSEMASTER in 1938. By that point, Europe and the rest of the world was bracing for war. 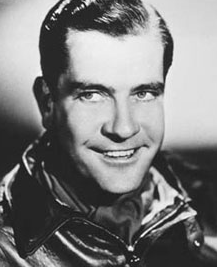 And the U.S.-born actor, feeling an overwhelming sense of patriotic duty (before it became the thing for all young men of Hollywood to do) joined the military-- specifically, the Royal Canadian Air Force. In August 1942 he would die in the air over Ontario. In that moment, he had realized the greatest role that he would ever know-- that of a war hero. Phillips Holmes present and accounted for..! Margia Dean was a beauty queen who had been crowned Miss California at the age of 17. She arrived in Hollywood in the 1940s hopeful, like so many other pretty girls, that she could become a movie star. 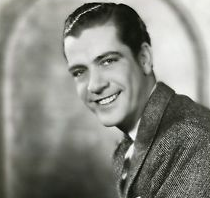 Though she was not signed by a major studio, independent producer Robert Lippert took an interest in her and after the war, he cast her in many of his low-budget pictures. She gained experience with Lippert's company and after several years of minor roles, she had her first lead in a rural adventure film in 1954. During the mid-50s, Margia turned up in many westerns which were popular at the time. But she would achieve her greatest success in the British horror drama THE QUATERMASS XPERIMENT in 1955. She continued in B films until the mid-60s, when she decided to focus on a new marriage and career opportunities outside show biz. Margia Dean present and accounted for..! Jack Hawkins was one of the most popular post-war British stars of his generation. He had acted in films back in the 1930s, but it wasn't until the late 40s, after a stint in the military, that he hit his stride usually playing no-nonsense figures in war films and crime dramas. His training had begun early-- by age 11 he was acting on the London stage; and by 18 he was on Broadway. Interestingly, his first wife was Jessica Tandy with whom he had a daughter. When his motion picture career peaked in the 1950s, he was remarried and had three more children. 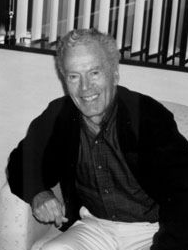 During this decade, he appeared seven times on the exhibitors' list of top box office stars in England (he ranked first in 1953 after a series of commercial and critical hits). By the 1960s, he had transitioned to character roles but remained in high demand by directors and costars who loved working with him. In later years, he lost his voice due to throat cancer, so his performances from 1966 until his death in 1973 were dubbed. 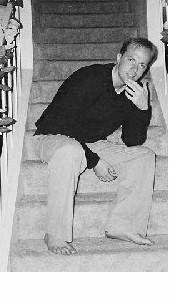 But Jack's masculine, authoritative presence was still very much in evidence. 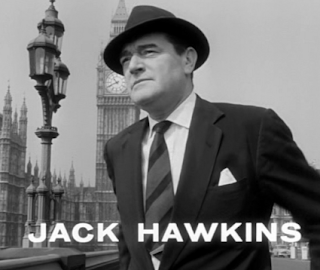 Jack Hawkins present and accounted for..! Anne Bancroft was under contract at 20th Century Fox when she first worked in Hollywood during the 1950s. The studio probably didn't know what to do with someone so talented. She was strangely typecast in westerns as a Native American girl, can you believe that? She plays one in an Audie Murphy movie, and then she was cast again in a similar role in THE LAST HUNT. However, that time she was injured riding horse and was replaced by Debra Paget. She soon left the movies, disappointed with the kinds of roles being offered, and headed back to the east coast. She found her niche on stage, triumphant as Anne Sullivan in THE MIRACLE WORKER, a role she recreated on film. Then there was that role nobody's ever heard of, Mrs. Robinson in Mike Nichols' THE GRADUATE. Other standout performances included dramatic turns in THE PUMPKIN EATER, THE ELEPHANT MAN and AGNES OF GOD. And there were comedies, like the remake of TO BE OR NOT TO BE, directed by husband and co-star Mel Brooks. Here's to you Mrs. Robinson, I mean Mrs. Brooks. 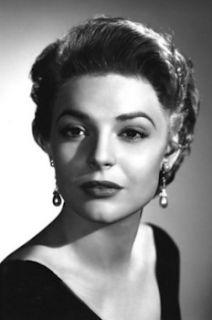 Anne Bancroft present and accounted for...! Oh I love Anne Bancroft! She was wonderful in every part she played, even those small parts in her later years, like the alcoholic mother in "Malice," had such impact. It's the most memorable part of that movie. My favorite was her role in, "Turning Point." She was almost fifty and could still play a believable ballerina, without an ounce of body fat. Talented, beautiful, classy, I could never quite picture her with Mel Brooks, but evidently they had a wonderful marriage with lots of laughter. Very nice comment. The one I love that seems a bit under appreciated is where she costarred with Anthony Hopkins-- 84 CHARING CROSS ROAD. She plays writer Helene Hanff. And yes, I agree she gives a convincing performance in THE TURNING POINT, opposite Shirley MacLaine. 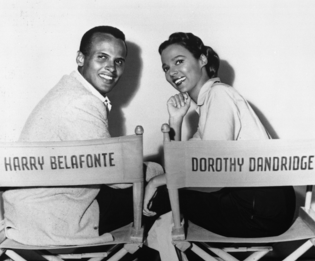 In the 1950s, the movie careers of Harry Belafonte and Dorothy Dandridge overlapped. And that was to our benefit. There were three collaborations, and all of these films are worth seeing. The first one, BRIGHT ROAD, was filmed at MGM. 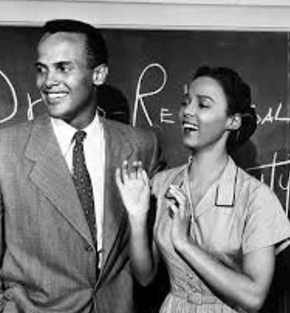 Its heartfelt story presents Belafonte as a school principal, and Dandridge as a teacher who tries to reach a boy that is struggling in her class. Their second feature was Fox's musical CARMEN JONES, based on a popular opera. 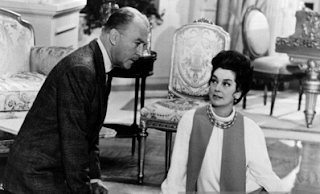 It was directed by Otto Preminger and showcased the talents of both performers in lead roles. A few years later, Fox cast them in supporting parts for the sudsy melodrama ISLAND IN THE SUN. While they would not make any more films together, Belafonte & Dandridge are still remembered today for the charm and sophistication they brought to the screen. Harry Belafonte & Dorothy Dandridge present and accounted for..! Saturday December 12th: Cary and the third Mrs. Grant. Sunday December 13th: Musical costars who did two Rodgers & Hammerstein adaptations. Monday December 14th: This month's special series kicks off with a popular dancer at Warners. Tuesday December 15th: An MGM child star who went on to produce the TV version of M*A*S*H.
Wednesday December 16th: A Fox starlet in the 40s, better known to noir fans as Laura Hunt. Thursday December 17th: An energetic drummer who enlivened musical numbers in classic films. Friday December 18th: Republic's top singing cowboy of the late 30s/early 40s, and his sidekick. Gordon MacRae and Shirley Jones? 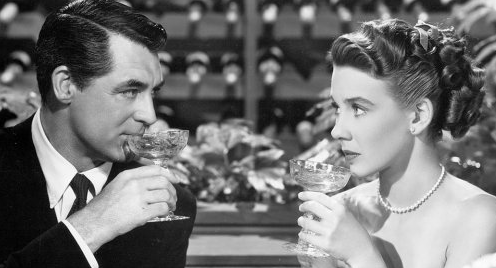 In the late 1940s, Cary Grant and Betsy Drake made their first motion picture comedy together. When filming began on RKO's EVERY GIRL SHOULD BE MARRIED, they weren't officially Mr. and Mrs. Grant, but that would soon change. When the film was released, critics and audiences took note of Betsy's flair for playing wacky heroines, something she would perfect in Warner Brothers' screwball farce PRETTY BABY two years later. 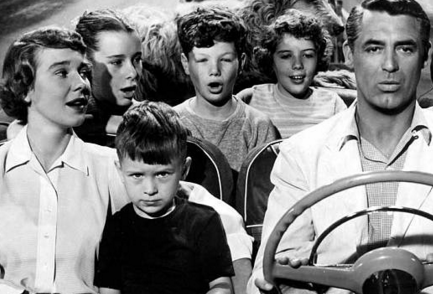 In 1952, the real-life couple reunited on screen in ROOM FOR ONE MORE, an adoption-themed family film. They also appeared in a weekly radio sitcom Mr. and Mrs. Blandings, which was based on Cary's earlier hit movie with Myrna Loy. 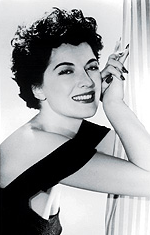 Betsy wrote some of the material for the show and would also served as an uncredited writer on HOUSEBOAT, which her husband did with Sophia Loren. Though their marriage ended in the early 60s, it was for a time a happy union. Betsy made several films with other leading men, but she eventually left the screen to devote herself to her artwork and a new career as a therapist. Betsy Drake & Cary Grant present and accounted for..! 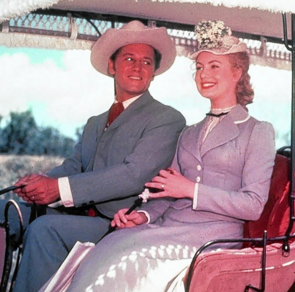 Gordon MacRae had already established himself as a musical star in the early 50s at Warner Brothers, mostly in productions featuring Doris Day as his costar. By the middle part of the decade, he was no longer under contract to Warners and was able to take parts on stage and in musicals for other studios. The rousing success of Rodgers & Hammerstein's Broadway version of OKLAHOMA! meant its journey to the big screen was inevitable. 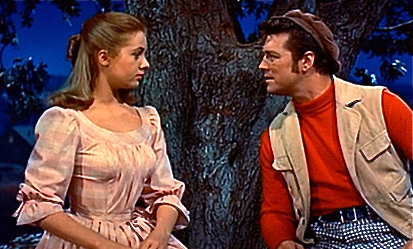 When Gordon was cast as Curly, producers picked a very young Shirley Jones to play his true love, Laurey. The duo teamed up again a year later for CAROUSEL, also a musical by Rodgers & Hammerstein. This time, Gordon was not the first choice for his role (Frank Sinatra had been cast but left the production amid legal issues with 20th Century Fox). But Gordon played Billy Bigelow perfectly, and Shirley was wonderful as Julie Jordan. Shirley Jones & Gordon MacRae present and accounted for..! 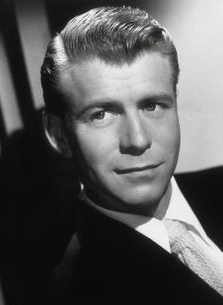 Gene Nelson had been inspired to become a dancer by watching movies featuring his idol, Fred Astaire. After the war, he had his chance on Broadway, and this soon led to a contract in Hollywood with Warner Brothers. Due to his appearance in TEA FOR TWO, which starred Doris Day and Gordon MacRae, he earned a Golden Globe as the year's best "newcomer." 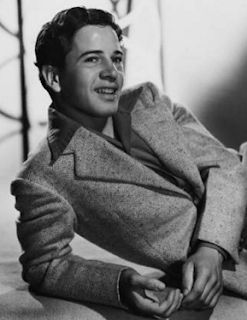 The studio paired him with Day in LULLABY OF BROADWAY and with Virginia Mayo in SHE'S BACK ON BROADWAY, but mostly he was a second lead in musicals. There was also a non-musical part in a noir called CRIME WAVE. 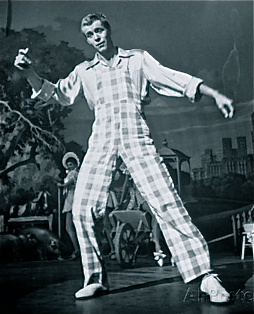 After his contract with Warners ended, he had a supporting role in the screen version of OKLAHOMA!, which reunited him with MacRae. Later, he turned to television directing, where he helmed many popular series of the 1960s. He also directed two Elvis Presley movies during this time. In the 70s, he was back on Broadway, earning a Tony nomination for his work in a Stephen Sondheim production. After he retired from the stage he turned to teaching at the college level. Gene Nelson present and accounted for..! Gene Reynolds was a child star who got his start in Hal Roach short comedies in the 1930s and soon found roles in features. Notably, he played the younger version of Tyrone Power's character in Fox's disaster epic IN OLD CHICAGO; he was a young violinist in Sam Goldwyn's THEY SHALL HAVE MUSIC; and he had an important part at MGM in BOYS TOWN and its sequel MEN OF BOYS TOWN. Like so many others, he transitioned to television in the 1950s, first as an actor, then as a writer and director. He really hit his stride in the 1970s, when he was responsible for writing, producing and directing episodes of weekly series like M*A*S*H and Lou Grant. Before he retired in 1999, he had received numerous awards and served four years as the president of the Directors Guild. Who says child stars can't succeed in Hollywood..? Gene Reynolds present and accounted for..! Gene Tierney is best remembered as Laura Hunt in Otto Preminger's classic film noir. 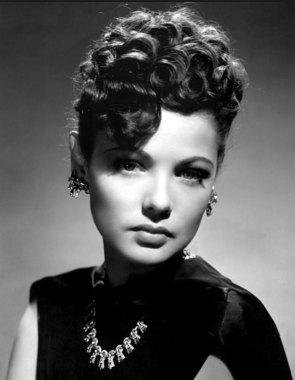 But it was not the first motion picture she made during her lengthy run as a starlet at 20th Century Fox in the 1940s. 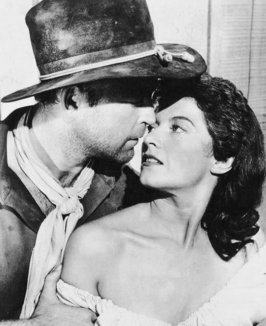 In fact, her initial role had been in the western sequel THE RETURN OF FRANK JAMES, opposite Henry Fonda. There was another western and assignments in other genres before she hit her stride in noir. 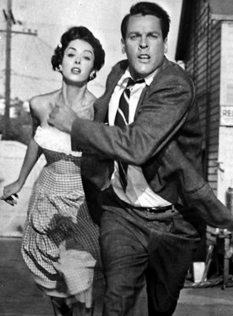 More crime dramas followed, like WHIRLPOOL and WHERE THE SIDEWALK ENDS, both also directed by Preminger. In 1962, after a seven-year absence from the big screen, Tierney would return in another Preminger picture, ADVISE AND CONSENT, where she once again costarred with Henry Fonda. Gene Tierney present and accounted for..! 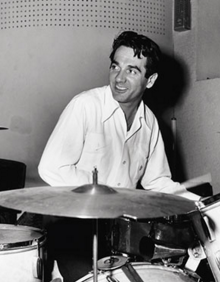 Gene Krupa enlivened musical numbers in classic films during the 1940 and 1950s. Since the mid-1930s, the Chicago-born drum player and bandleader had been a household name. 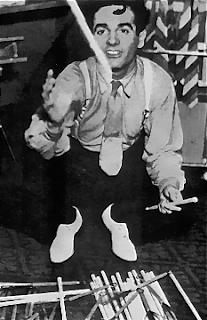 If you've seen him performing his hit 'Drum Boogie' in BALL OF FIRE with Barbara Stanwyck, you know how audiences responded to his uniquely energetic style. In the late 40s, Krupa and his band were top-billed in Columbia Pictures' romance drama GLAMOUR GIRL. There were other movie appearances, and in 1959 the ultimate compliment was paid when Columbia made Krupa the subject of a biopic starring Sal Mineo. Krupa continued to perform in public until the early 1970s shortly before his death. Gene Krupa present and accounted for..! In the early 1930s, Gene Autry was the star of a country-and-western radio show in Chicago when he hired fellow musician Smiley Burnette to play accordion and various other instruments alongside him. 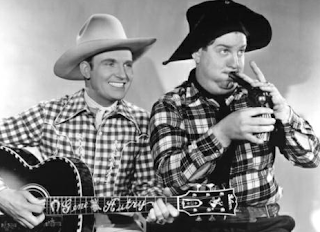 The duo was very popular and when Hollywood decided to present singing cowboys in sound films, these two were signed up. At Republic studios, Autry & Burnette made over 60 films. During the war, while Autry served in the military, his sidekick left Republic and moved over to Columbia. At his new studio, Burnette added musical touches and comic relief in over 50 films starring Charles Starrett. After the war, Autry returned to Hollywood but he also left Republic and moved over to Columbia. 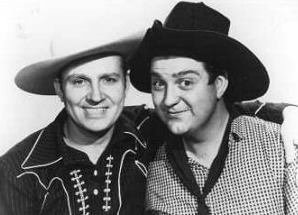 When Starrett's career wound down, the studio reassigned Smiley Burnette to work with his old partner, Gene Autry. Some things were just meant to be. Gene Autry & Smiley Burnette present and accounted for..! Saturday December 19th: A wisecracking leading lady and her frequent British leading man. Sunday December 20th: Change of season with an actress whose last name fits the occasion. 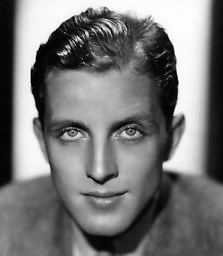 Monday December 21st: Loretta Young's first husband, a leading man in the 30s. Tuesday December 22nd: A strong-willed character actress who was a lady for a day. Wednesday December 23rd: Could have been a lead, but instead played villains in the 50s. Thursday December 24th: A Hal Roach beauty of the 30s who supported big name comics. Friday December 25th: A golden age Scrooge and a golden age Kris Kringle. 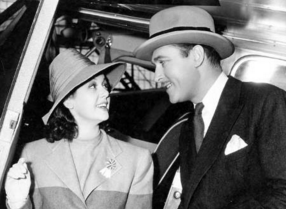 Rosalind Russell and Brian Aherne first appeared together in Universal's romantic comedy HIRED WIFE in 1940. It was a big hit with audiences, and obvious to everyone the two worked well as a team. A short time later when Roz left MGM and signed with Columbia, it was not surprising that she asked her new studio to hire Aherne to play her leading man again, in other comedies. The first version of MY SISTER EILEEN and Irving Cummings' WHAT A WOMAN! were also successful with movie goers. The duo developed a lasting friendship, and in the mid-60s they would reunite on screen once more. That time it was do ROSIE!, based on Ruth Gordon's play, which brought them back to Universal. Brian Aherne & Rosalind Russell present and accounted for..! Dana Wynter was from a German family but raised mostly in England. Her career began in the British film industry in the early 50s, but by the middle of the decade she had left Europe for America. She found work in television anthologies produced in New York and was spotted by a talent scout for 20th Century Fox. In 1955, she appeared in her first picture for the studio, THE VIEW FROM POMPEY'S HEAD. But it was a film away from her home studio that she would be most remembered for: the original version of THE INVASION OF THE BODY SNATCHERS. She continued to make a series of pictures for Fox, across various genres until 1960. Then she transitioned back to television, though she occasionally still appeared in movies (two produced in Ireland). In later years, she divided her time between a home in California and a home in Ireland. She had a role on an Irish television series before retiring from the screen. Dana Wynter present and accounted for..! Grant Withers began his motion picture career at the end of the silent era. Because of his rugged good looks, he was signed by Warner Brothers and cast as a lead in several early talkies for the studio. Two of those films paired him with a very young Loretta Young. When he and the underaged actress eloped (she was only 17), they faced widespread media coverage and within a year the marriage was annulled. Withers continued to appear in motion pictures through the 1930s but by the end of the decade had slipped to supporting roles. In the following decade, he became a widely sought character actor, often appearing in films with his friend John Wayne. 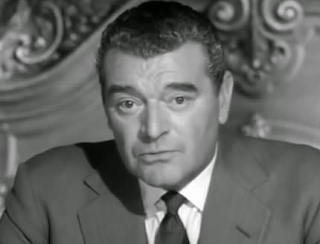 Withers was under contract during this period with Republic Pictures. And from 1937 to 1957, he made 60 films for the studio. By the late 50s, he was working mostly in television, usually in crime dramas and westerns. He died in 1959 with around 200 movie and TV credits. Grant Withers present and accounted for..!